Wood, nails, concrete, and human labor: For the most part, building a house hasn't advanced much in a hundred years. What if that could all change with the help of giant robotic printers? That's the world Berikos Khoshnevis envisions. Khoshnevis, an engineer at the University of Southern California, is one of a handful of pioneers creating machines that can custom-print buildings. Construction has problems built into it. Every year in the United States, 400,000 workers are seriously injured or killed doing construction work, according to OSHA. There are also environmental problems: Construction of a typical single family home generates a waste stream of three to seven tons — including wood, drywall, and roofing materials that are sent to the dump. Around the globe, more than 40 percent of all raw materials are consumed in the construction process. In addition to wasting valuable resources, construction contributes significantly to environmentally harmful emissions, Khoshnevis says. That's why he's working on a giant 3-D printer that could soon construct homes. The prototype built by Contour Crafting, a company started by Khoshnevis, was able to build a 2,500 square foot house in just 20 hours (compared with seven months on average for a conventional home from start to finish). Contour Crafting isn't alone: San Francisco-based Apis Cor printed a small house in just 24 hours. And a Chinese company called Winsun recently announced they used 3-D Printing to create ten homes in a single day. The machine is loaded onto a truck and drives to the build site, where once in place it swings on an arm that swivels in all directions. An architect loads up a design. The robotic arm squirts out layers of concrete, bit by bit, to build up walls and structures — like toothpaste being squeezed onto a brush. The construction can also include plumbing and electrical work, supplemented by other robots on the ground. The system can also construct interlocking pieces offsite to be brought in like LEGO blocks — something similar to conventional pre-fabricated construction methods, just using a printer. Khoshnevis says the first applications will be emergency shelter and low-income housing, especially in developing countries. He explains that urban settlements in the developing countries are, at present, growing five times faster than those in the developed countries. In some places, 3-D printed houses could be strong enough to withstand serious earthquakes — something that isn't true of many hastily-built structures in developing cities. Eventually, Khoshnevis predicts many homes will be built using printers — allowing people to lower cost, increase customization and reduce waste in construction. Using 3-D printing also allows people to work in construction who don't typically do so, including women, the elderly, and the disabled. “This technology is basically design and software control," Khoshnevis says. "It lets people take part because they can use that information technology rather than muscles to move material around." Enrico Dini, an Italian inventor who created a 3-D printer that can create structures with domes and spheres, says 3-D printing can open up new realms of design — limited only by human imagination. “Beauty can let the people feel better and prouder to exist," he says. "So I truly believe that making beauty affordable in architecture is something that is worthwhile." Dini collaborated on the first 3-D-printed bridge, which opened in Madrid last December. The structure is printed in micro-reinforced concrete, and measures 40 feet long and 6 feet wide. 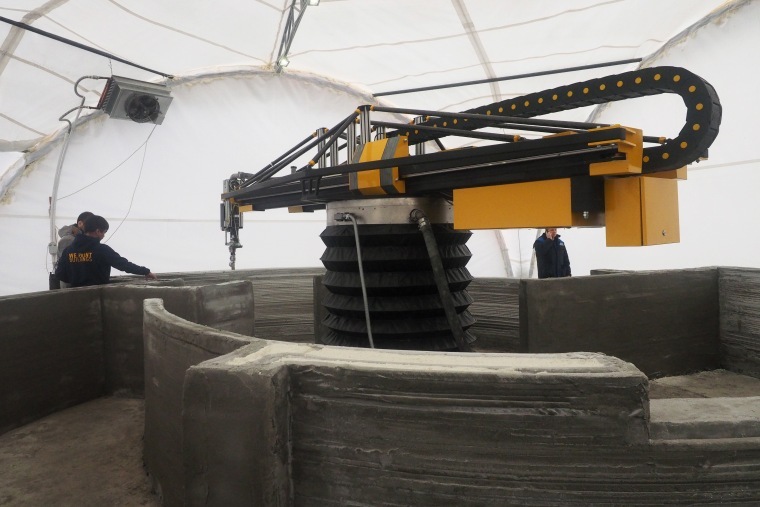 He says that in the future it may be possible to use all local materials as the basis for construction, and he is working on experiments to use soil, water, and cement to print houses. Using local materials will be even more important when 3-D printing could be used to construct housing on other planets. Selective Separation Sintering, a new 3-D printing process developed by Khoshnevis to build physical structures in space, recently won first place in the NASA In-Situ Materials Challenge. It's too expensive to rely on materials sent from Earth to build in space, Khoshnevis says. In addition, using resources found in space could save considerable time. The prize-winning tech combined robotic construction with high melting-point ceramics, such as magnesium oxide (readily available on the moon and Mars) and ordinary regolith (planetary soil) to produce tiles that could withstand the heat and pressure of exhaust plumes from landing spacecraft. “This is just the beginning for this technology; the future is ahead of us,” Khoshnevis says. “Humanity will conquer the solar system and beyond.” And when we get there, we're going to need a roof over our heads.